NMT: Nicely work and very professional! Les centrales solaires utilisent l’énergie solaire pour produire de la chaleur qui est ensuite convertie en électricité. Des centrales d’énergie à chenal parabolique comme « Solar » sont constituées de milliers de miroirs paraboliques disposés en chenal qui dirigent les rayons solaires vers des tubes absorbants couverts d’un revêtement spécial (récepteurs). Les rayons solaires chauffent l'huile thermique coulant dans les récepteurs à presque 400 degrés Celsius (plus de 75 degrés Fahrenheit) de sorte que les échangeurs de chaleur en aval puissent produire de la vapeur. « Solar » devrait commencer à fournir de l’énergie solaire au réseau en juin 2007 et devrait produire suffisamment d’énergie pour satisfaire aux besoins de 40 000 foyers. Le recours à l’énergie solaire plutôt qu’à l’énergie fossile pour produire de l’électricité permettra de réduire les contribuants à l’effet de serre, dont l’équivalent serait de retirer environ un million de voitures des autoroutes américaines. Grâce à l’extraordinaire performance de tous les types de technologie solaire, ainsi qu’à leurs coûts de production d’électricité inférieurs, les centrales d’énergie paraboliques vont bientôt permettre de produire de l’électricité dans les régions du monde à fort rayonnement solaire à des coûts comparables à ceux des centrales fonctionnant à l’énergie fossile. Solar power plants utilize solar energy to produce heat, which is then converted into electricity. Parabolic trough power plants, such as Solar, are comprised of thousands of parabolic mirrors arranged in rows that direct the solar rays towards absorber tubes, which are covered by a special coating (receivers). The solar rays heat the thermal oil flowing in the receivers to more than 750 degrees Fahrenheit (nearly 400 degrees Celsius) so that the heat exchangers downstream can produce steam. Solar should begin providing solar energy to the grid in June of 2007, and should provide sufficient energy to satisfy the needs of 40,000 homes. Resorting to solar energy to produce electricity, rather than fossil fuels, will allow for the reduction of greenhouse gases, equivalent to removing a million cars from American highways. Thanks to the extraordinary performance of all types of solar technology, as well as their cost-saving benefits in the production of electricity, parabolic power plants will soon allow for electricity to be produced in regions of the world where solar radiation is plentiful, at costs comparable to those of power plants using fossil fuels. Experience Years of translation experience: 14. Registered at ProZ.com: Oct 2002. Professional practices Scott de Lesseps endorses ProZ.com's Professional Guidelines. Hello, and welcome to my profile. If you are seeking quality translations and/or proofreading, you have come to the right place. I specialize in French to English translation, and also provide proofreading services for English texts. 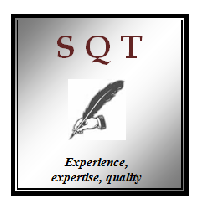 I invite you to visit my web site also, at www.4sqt.com. Click here to e-mail me for information or for a free quote. Fields of expertise include: commercial and financial (annual reports, financial statements and notes, press releases/PR, etc. ), IT, legal/contracts, technical, pharmaceutical and health care, among others. If your area is not mentioned here, please inquire. I will be glad to look over your document and give you an honest assessment. I carefully screen projects before accepting them to ensure they are projects for which I am qualified. I studied translation in Montréal, where I lived for 2 1/2 years, and have first-hand knowledge of French-Canadian dialect, slang and culture. I am a native speaker of English, and possess excellent writing, proofreading and editing skills. Please see my resume for lists of types of documents translated and companies benefitting from my translation services. A personal note: Translation is a craft for which I have a great deal of passion. You can rest assured that I will do my best to produce a target text that captures, as much as possible, the essence and flavor of the original. I will put my knowledge and expertise to work for you. I earned my certificate in French-English translation from New York University. I studied translation at Université Concordia in Montréal, Québec, Canada. I studied advanced French at Université de Montréal (École de français), and Université du Québec à Montréal. I graduated with a bachelor's Degree in Management Science from Virginia Tech. I have experience translating in a variety of areas; fields of expertise include business, computers, medical (including pharmaceutical and clinical trials) and legal. Projects include translations for the Greenpeace newsletter, World Bank and localization (web site translation) for: chapellenotredamedelamedaillemiraculeuse.com and brunochaza.com. I am currently providing translation services in conjunction with other web sites. a broad and extensive background in computers, with a bachelor's degree in Management Science from Virginia Tech. several years of experience working with a variety of hardware and software. experience as a computer help desk analyst, providing my troubleshooting and consulting expertise to the university community at Virginia Tech. experience with HTML, FTP, web site/graphic design and management. I am dedicated to delivering a quality, accurate, and on-time finished product. I understand the importance of keeping abreast of the rapidly changing world of technology. The customer's satisfaction is my #1 goal in my service, so I'm not satisfied unless you are. Rates determined on a per-project basis, and may vary according to factors such as desired turnaround time and technical level of the text. Unless otherwise requested, all work is performed via the Internet. This saves us both time and money, as it avoids costly postal and overnight fees. Let me put my expertise to work for you! Click here to e-mail me for information or for a free quote. Transcription, proofreading and editing services also available.